The Blue Devils' four freshmen put on a show and embarrass No. 2 Kentucky in a 118-84 win. INDIANAPOLIS — The inevitable horror has arrived. The time has come. The birth date of Zion Williamson: July 6, 2000. And of R.J. Barrett: June 16, 2000. And then Tre Jones: Jan. 8, 2000. The world has reached that point when people born in the year 2000 not only can feed themselves, operate motor vehicles and speak full sentences without burbling. 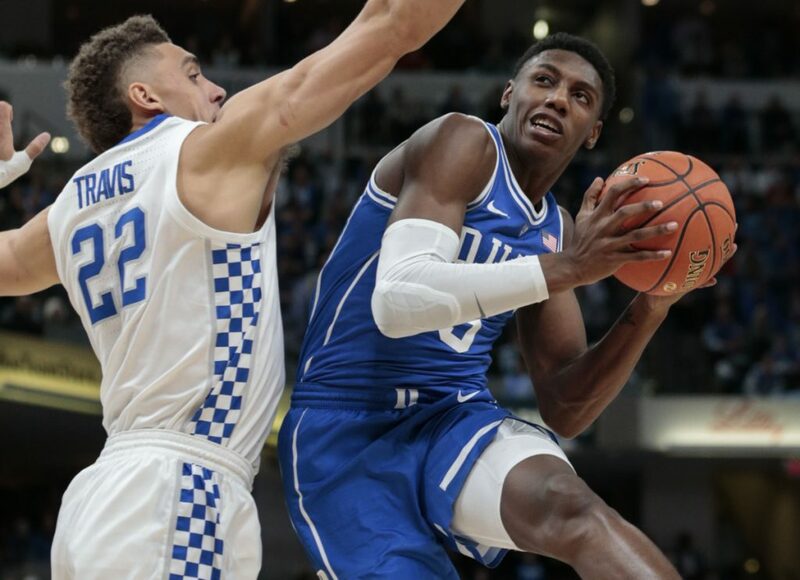 No, they can craft outlandish, fearsome feats of collaboration and beauty such as that on Tuesday night from Duke’s freshman class of Williamson, Barrett, Jones and Cam Reddish, with Reddish benefiting from the extra learning of having arrived on Sept. 1, 1999. They can beat No. 2 Kentucky in a season opener by a score that kept looking false until it landed on an implausibly true 118-84, and figures to spend a good while as unforgettable. They can look rich in a maturity they weren’t supposed to have yet. They can astound. They can surprise Mike Krzyzewski when it’s hard to surprise Krzyzewski, the septuagenarian coach in his 39th Duke season. Somehow, four scandalously young people who last year still roamed the hormonal hallways of high school in South Carolina (Williamson), Pennsylvania (Reddish), Minnesota (Jones) and Florida by way of Toronto (Barrett), wound up administering the most points against mighty Kentucky in 29 years, the biggest blasting of Kentucky in 10, the worst loss in the 26-season, three-university career of Kentucky Coach John Calipari, and the third-worst loss ever by an Associated Press top-five team. With all of that, they went ahead and framed a new national season on its first night, establishing themselves as the mastodon whose No. 4 ranking looks too low by three, and constructing a reference point that will hover from here to March and from coast to coast. That would figure to replace the offseason hovering of courtrooms and wiretaps and illicit payments, giving the sport a fresh topic it might not deserve as spectacle and marvel triumph yet again. Certainly the foursome arrived to Duke with their gaudy Rivals recruiting rankings – Nos. 1, 3, 5 and 14 nationally – and their seasoning born of the nomadic basketball travels afforded teenage sensations. Yet they played with a cohesion that betrayed their ages. As they stop by Duke for a year of polish before ascending to the NBA, they’re supposed to spend November with the polish coming only in small and intermittent globs. Instead, they played with a maturity that might reflect these details: Reddish’s father played for VCU, Jones’ older brother played for Duke, Williamson’s stepfather played for Clemson and Barrett’s father played for the Canadian national team. Knowledge of how to play seems to have gone imbued. “The way they were talking on defense, moved the ball and the way they were attacking the rim,” all qualified as “very mature,” in the view of Kentucky graduate transfer Reid Travis. Krzyzewski has had his freshman tandems of Winslow, Okafor and Jones, or Bagley, Carter, Trent and Duval, but he had not seen an opener like this. The four had so many aggregate skills that they looked like eight. As his descriptions backlit the collaboration and sparkling talent everyone had just seen, a nascent season had found definition, with Duke as the giant primed to spend the winter looming, further proof that, tough as it can be to take, people born in 2000 are all grown up.